CHICAGO — CPB announced Wednesday additional funding for projects focused on boosting podcast development among communities under-represented in public media. 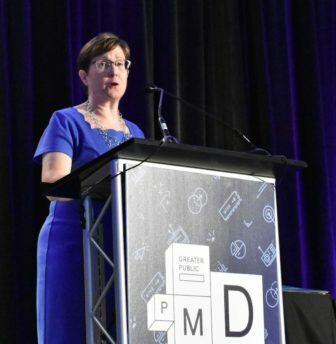 The funder revealed the support for initiatives spearheaded by PRX and New York Public Radio during a luncheon at the Public Media Development and Marketing Conference. “These two projects, supported by CPB, use podcasting as a way to bring new voices, new audiences and new revenue to public media,” said Kathy Merritt, CPB’s SVP for journalism and radio. CPB will give PRX $1.5 million for the second round of Project Catapult, which helps producers at public media stations develop podcasts. The upcoming round will focus on stations in the South and West and in rural areas. Two cohorts of five stations each will participate in the 20-week curriculum, which uses a design thinking process. PRX will provide three years of distribution and support for podcasts developed through the program. Applications will be accepted in August and in March 2019. Project Catapult launched in 2017 and included Out of the Blocks, a podcast from Baltimore’s WYPR that won a 2018 National Murrow award. New York Public Radio will use a $200,000 CPB grant to support its women’s podcast festival Werk It this year and next. This year’s festival, Nov. 13 and 14 in New York City, will give attendees the chance to pitch podcast ideas to a jury of producers. Winners will work on pilots with WNYC Studios. Launched in 2015, Werk It seeks to help women in podcasting network and build skills. It’s part of WNYC’s Women’s Voices Initiative, which aims to increase the number of women hosting audio programs in public media. The initiative launched in 2014 with CPB support.